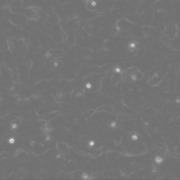 Jets or relatively high-speed currents occur widely in geophysical flows, flows dominated by the combined effects of rotation and stratification. In the Earth's atmosphere, a prime example is the jet stream; in the oceans, there are many others such as the Gulf Stream, Kuroshio and Agulhas currents; and in planetary atmospheres they are ubiquitous, as evidenced by the highly-banded structure of Jupiter's atmosphere. A key question which we have been researching is why jets spontaneously arise in so many circumstances. Pioneering work in the late 1950s by N. A. Phillips, R. Hide and D. Fultz identified the fundamental process leading to jet formation, namely 'jet sharpening' by potential vorticity (PV) mixing (see review here and figure right showing early, intermediate and late times of the PV field in an idealised numerical experiment of freely-decaying turbulence in a rotating shallow-water fluid - Dritschel & Scott 2011). The importance of waves and turbulence on an inhomogeneous (Rossby-wave supporting) background was later identified by P. Rhines (1975). On a linear background PV gradient (a 'beta plane'), Rhines argued that jets should emerge at a scale LR = (U/β)1/2, where U is a characteristic velocity associated with the turbulence. This scale is now widely known as the 'Rhines scale'. It was derived by simple scale analysis assuming the flow is 'barotropic' (or two-dimensional), but is widely used as an estimate for the spacing of jets in a variety of situations. 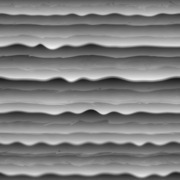 The importance of an underlying positive feedback mechanism in jet formation and sharpening was recognised only recently, beginning with M. E. McIntyre (1982) - see above review. 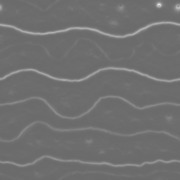 Waves propagating on a background PV gradient are induced to break by the action of turbulence. 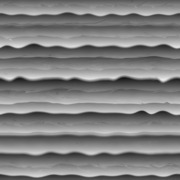 The wave breaking results in efficient mixing of the background gradient, reducing it and, thereby, facilitating further wave breaking. Meanwhile, barriers or interfaces form between these increasingly well-mixed regions and, under the continued action of turbulence and shearing in the vicinity of the emerging interfaces, these interfaces sharpen. 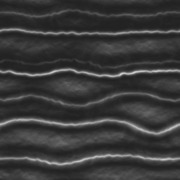 This wave-turbulence positive feedback mechanism, we hypothesise, underlies the emergence of coherent structures - not just jets - in many physical systems. 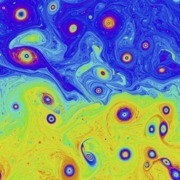 Our research has aimed to determine how universal this mechanism is, and how it depends quantitatively on 'parameters' such as the intensity of turbulent mixing (supplied initially or maintained), frictional or thermal damping, ratios of key length scales (such as the Rossby deformation length LD and the Rhines scale LR), etc. 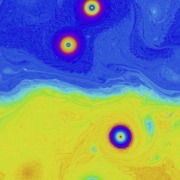 This research has verified that potential vorticity gradients not only steepen in emerging jets but they can become effectively unbounded in the limit of vanishing forcing and damping (see figure above, showing PV at early, intermediate and late times in an idealised simulation with infinite LD). Moreover, in certain parameter regimes, mixing can nearly completely homogenise potential vorticity between the jets, leaving behind a 'potential-vorticity staircase' - a monotonic, piecewise constant profile in latitude - the most extreme outcome of the positive feedback mechanism (see here). It turns out that the Rhines scale LR does not alone predict the final observed jet spacing in even idealised experiments, since the arguments make use of a linear background PV gradient and the associated dispersion relation for Rossby waves. While jets may initially emerge at LR, as they develop they modify the zonal-mean background PV gradient, altering the dispersion relation significantly. This changes any estimate of LR in a nearly unpredictable way. Furthermore, with sustained forcing, there exists another length scale (or more), complicating matters further. The most intense jets, we find, occur when the forcing is exceedingly weak (and any dissipation is comparably weak or weaker) - and then only after very long times (might this explain jets on Jupiter?). The interplay between all these length scales has not yet been fully examined, and it is a major thrust of our current research. 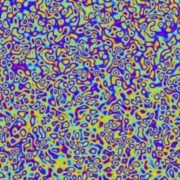 An example of this complexity is shown in the figure right, all for late-time statistically-equilibrated flow states (PV), with the Rossby deformation length decreasing from left to right. What one sees is the disappearance of jets and the emergence of vortices. 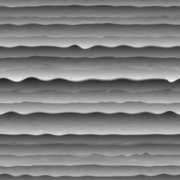 The latter, in fact, may be though of as closed jets or loop currents, and possess steep gradients of PV at their edges, just like the jets at larger LD.